There is a walnut tree near the end of the lane where I live. Although it still produces walnuts, the tree is not as productive as it could be. For one thing, there is a huge vine that has grown around the tree for many years. When we moved there, I tried to cut away the vine, but the damage had already been done. The vine had obviously hindered the growth of the tree. Secondly, there is the remains of an old fence that was nailed to the base of the tree many years ago. 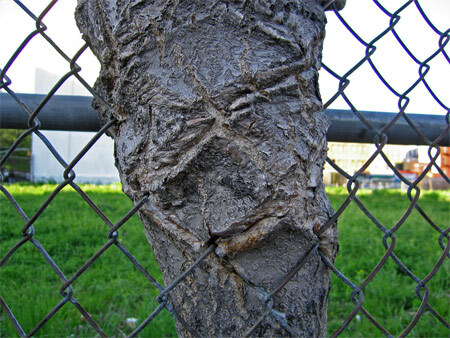 Whoever tacked the fence to this valuable tree was trying to take the easy way out. In doing so, the tree was harmed. While the tree has shown a remarkable amount of resilience, it has suffered the consequences of having to deal with the vine and the fence for many years. Its productivity has no doubt been limited. So it is with the effect of sin and distractions in our lives. The things that we allow to grow around us and be attached to us can hamper our effectiveness as we live for the Lord. How much better it would be for us and for those we are trying to serve if we could keep ourselves free from the things that limit our production. “The seed falling among the thorns refers to someone who hears the word, but the worries of this life and the deceitfulness of wealth choke the word, making it unfruitful.”—Matthew 13:22. This entry was posted in Christian Living, Communion Meditations, Leadership and tagged distractions, fence nailed to a tree, fruitful, illlustration, Matthew 13:22, parable of the sower, productive living., sin. Bookmark the permalink.